Anyone here got a watch Instagram? wandering_watches here. Let’s get the forum more social! Tudor gmt today, have a good day all! Strap cost more than the watch!!! Waiting!? Break out the tools and get the kettle on. I bought a c65gmt in the sale last year, quality watch, it truly is on par with stuff twice the price, however I’m just no connecting with it yet, I’ll keep plodding though. I bought it from @vokeyuk a couple of months ago so perhaps he can shed some light? So, amongst my family and friends it is widely known that I’m “the watch guy” that weird member of the family that likes watches, as such I get everyone’s old watches, not to sound ungrateful, I love watches and I’m lucky they recognise and support my stupid hobby, however the doesn’t mean I’d like another broken swatch, thanks. Anyway that changed today when my girlfriend presented me with this ... A lorus chronograph, not working and on that god awful bracelet, although with a quick battery and strap change it became this! I must say I’m delighted with it for a grab and go! 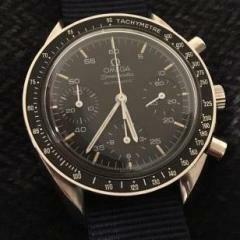 I’d say @JayDeep was on to something, for me it would be the omega speedmaster, sapphire version. Everyone in our circle knows exactly what it is, it’s wearable on bracelet, leather or rubber. However it flies under the radar for most. It’s not cheap but for an end game watch I’d say it was achievable. This is my old 1997 reduced, I sold it because I’m a idiot, I am now in the process of saving for a moonwatch, pray for me. Moving on my 2017 Omega SM300 - am I mad? Just out for a coffee this morning. Enough now, my speedy savings account can’t handle anymore of these shots! Enjoying the simple things today. Some great watches on show gang! Sat in departures waiting to go back to England, have a good day all!